Friends in Yogyakarta, join Fulbright alumnus Dr. Baskara Wardaya, S.J. 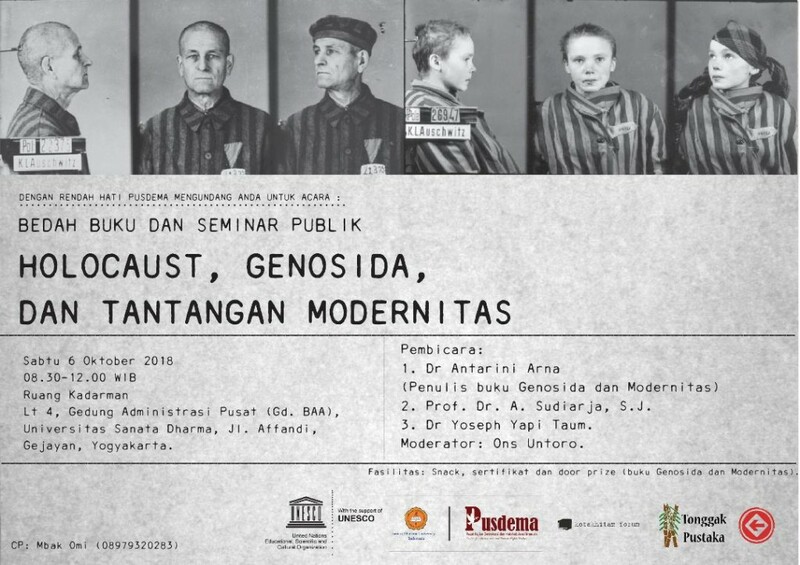 tomorrow, October 6, 2018 at 08.30 – noon, at Sanata Dharma University, Yogyakarta for a seminar on the Holocaust. This event is held by Center for Democracy and Human Rights Studies (PUSDEMA) at Sanata Dharma University in Yogyakarta, and is part of series of activities held in cooperation with UNESCO and the Holocaust Museum in Washington, D.C.
Dr. Baskara Wardaya, S.J. is director of PUSDEMA, AMINEF’s Trustees and former Fulbright Visiting Scholar (for an account of his Fulbright experience, see his profile in The Ripple Effect, pp. 27 AMINEF/Fulbright 25/65 anniversary publication). Venue & list of speakers are on poster.